Offering even more security than your average BlackBerry handset, the Sikur GranitePhone uses a forked version of Android called GraniteOS to keep your communications and personal information away from prying eyes. Phone calls are encrypted as are your chats and messages. 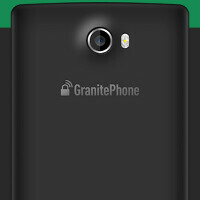 Outside of offering you protection, the GranitePhone does not provide much functionality. With the GranitePhone, you can make regular calls over a GSM pipeline and send/receive SMS messages. A camera on back will allow you to shoot photographs, and you can set up a standard Exchange, POP or IMAP email account. But there is no way to load apps on the device. That, however, is a feature that we will probably see on future versions of the handset. According to Sikur CEO Fred D'Avila, "The natural evolution for us is going to be going to applications stores. I''m not going to say that we're going to do our own, but we do want to let customers install approved applications one way or another." Another future feature will be the ability for users to make secure video calls. The GranitePhone comes with a 5-inch screen, carrying a 1080 x 1920 FHD resolution. Under the hood is the Snapdragon 615 SoC with an octa-core CPU and the Adreno 405 GPU. 2GB of RAM is inside, along with 16GB of non-expandable storage. There is a 16MP camera adorning the rear of the unit, while on the front you will find an 8MP snapper. The 2700mAh battery can not be accessed. The company notes that while the GranitePhone is for security focused governments and corporations, 15% of its sales have been to individuals. Still, this is not your usual consumer-oriented smartphone company. CEO D'Avila says, "We're not working on bringing new devices out in a typical consumer timeframe. We don't expect our customers to be changing hardware in less than two years." Sikur built the phone for those who employ its secure desktop device, and need to get out in the field. If you want a handset to snap pictures of your lunch to post to social media, keep moving on. But if security is paramount and you need to make sure that what you say or write on your phone isn't seen by others, the GranitePhone might be the device for you. The handset is available from the sourcelink for a price of $999. Yeah! You don't change the winning team. Apparenly reasonable specs were against security and they eliminated it. I would rather buy an iPhone than pay 1K$ for a Snapdragon 615 device. because despite the 'hardware' battle, Apple runs well on their 'hardware'. And simply 'works'. Not to mention they can walk into any apple store for support....a luxury all in its own. Android and security doesn't go very well together. Encrypted Blackberries are definitely a better choice.